What’s your favourite thing about the holiday season? For many, it’s the feeling of love and generosity in the air. People seem to be happier, warmer, and more willing to help one another. 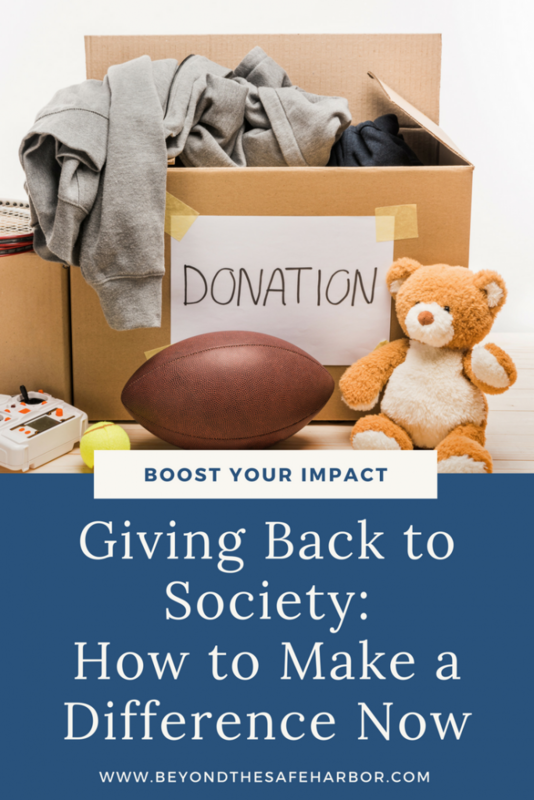 It’s a time of giving back to society, and giving to others. After all, we have so much to be grateful for! But during this busy season, how can we make a difference in our communities? Today’s post shares a few things we can start doing today for a brighter tomorrow. You don’t have to write a cheque to give back, and your time can often make an even bigger impact. And there are so many ways to give back locally! You can volunteer at a specific event, or sign up for something longer term. Check out websites like Volunteer Match and Idealist.Org to see if they feature your city. I love how Volunteer Match helps you find opportunities tied to what you’re passionate about! Have a specific cause or organization in mind? Give them a call to see what they need and set up something more customized. Worried you won’t be able to find the time to volunteer? Make it a work event! I’ve done a bunch of volunteering with my team at work. It was a great way to give back while also acting as a team building exercise. Plus, it will exceed your team’s expectations. Dollars can also go a long way in giving back to society. While you can simply make a donation to a charity of your choice online, this can sometimes feel impersonal. Reflect on what you value, what causes could use the most help, and where your dollars would go the furthest. If you’re passionate about a specific initiative, request that your donation go to that project. Instead of buying someone a holiday gift, make a donation in their name to a charity or cause that’s important to them. This is especially good if the person has everything, is hard to shop for, or isn’t big on gifts. Donate things versus money. Women’s shelters, for example, are often in need of basic hygiene items like toothbrushes and feminine hygiene products. Call them to find out what they need. You can also donate non-perishable food items to food banks, or carry extra granola bars to give to homeless people come across. Toys work too for holiday toy drives! If you have some time, consider donating blood! Your local or federal organization can provide more information about whether you’re eligible and help find a donation location close to you. To amplify your impact, get others involved! Have everyone bring a non-perishable food item to your Christmas party. Organize a few hours volunteering at the food bank for you and some friends. Pay for the order of the person behind you in line at the coffee shop. (While they may not be in need, it will start a chain reaction of giving!) Be that catalyst of change and you’ll see a domino effect around you. The holidays are a great reminder that there’s so much we can do to give back to society and improve our communities. Make a difference this season and leave a comment letting us know how it went! Great post, Kate. Just by being mindful, we can make such a difference. Sometimes small gestures mean to much, like you’ve mentioned… it can start a chain reaction of giving. Sadly, life gives us too many opportunities to stand up for others or against something wrong. And, we simply choose to look the other way. Instead, I wish more of us had the courage to blow the whistle on discrimination, fraud and other wrongdoings.